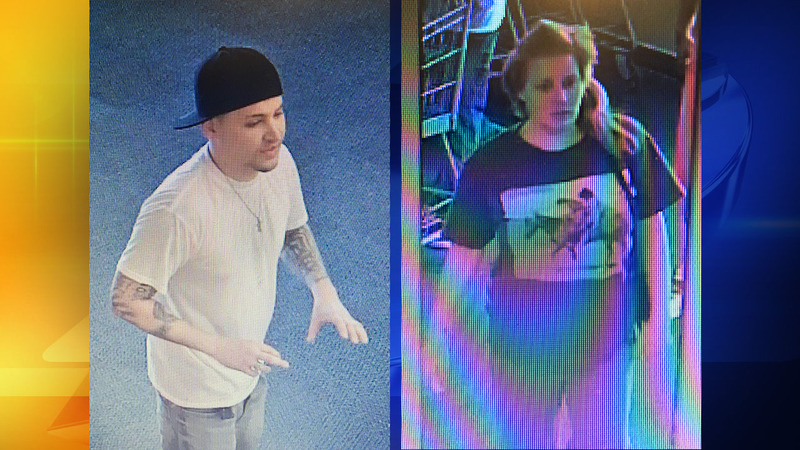 CLAYTON, NC (WTVD) -- Clayton Police are seeking the public's help to identify a man and woman who stole meat Sunday afternoon from the Food Lion near Riverwood Athletic Club at 238 Pritchard Road. Police said a woman went into the grocery store at 2:58 p.m. Sunday stuffed about $60 worth of steaks into a bright blue, drawstring gym bag. Employees who became suspicious began to monitor the couple, who also had a cart full of groceries. The man and woman then staged a verbal domestic dispute, police said, abandoned their cart and stormed out of the store to drive off in a dark gray Ford Explorer with an N.C. license plate beginning with "DLY." While reviewing security footage, police noticed a man who appeared to be acting as a lookout for the thieves in the lobby of the Food Lion. When the couple left the store, the lookout walked over to a Cashpoints ATM. After circling the building, the thieves picked up the lookout in the Ford Explorer and drove off on Pritchard Road toward the intersection with Covered Bridge Road. The lookout is described as a slimly-built black man who wore a black flat brim hat, red short-sleeve shirt, red shorts and Nike high-top sneakers. Anyone with information is asked to call the Clayton Police Department at (919) 553-4611.